Genre: Scrolling beat 'em up. As development houses go, Novotrade were nothing if not eclectic. In between creating epic aquatic adventure Ecco the Dolphin and hummingbird-based 32X shoot ‘em up (yeah, you read that right) Kolibri, they found time to try their hand at a cybernetic scrolling smash ‘em up by the name of Cyborg Justice. It does what it says on the tin, but for a 1993 Mega Drive game, it was difficult to get too excited over Cyborg Justice. It’s not Double Dragon-bad, but still some way short of pugilistic champions Streets of Rage, Golden Axe and Final Fight, all of which (and to varying degrees, all of their respective 16-bit sequels) delivered more fun and stronger cooperative multiplayer than Cyborg Justice. Still, it would be harsh to dismiss the game out of hand as it does offer some progressive ideas alongside some solid if rather unexciting action. As the rather nifty opening cinematic implies, you play as a space marine who, after unceremoniously crashing his ship into a mining colony, has his brain transplanted into a cybernetic body, with the want to make a metallic vegetable slave out of him. The process of altering his brain goes awry however and, lo and behold, it’s up to the player help him escape his bleak unearthly surrounds. Cyborg Justice’s most distinctive feature lies in the customisable suit you get to twiddle with before deploying. There’s a bunch of different heads, bodies and legs that offer their own attributes and abilities, whilst the enemies you’ll come across over the course of the game similarly stem from a myriad of combinations. If movies have taught us anything, it's not to stand on the Flubber! Controls are fine though movement on the whole is a shade on the sluggish side, no doubt impressing the weighty nature of robotic combat, though there’s a considerable array of moves to master, even if they’re not always entirely intuitive to input (block, jump, somersault and crouch are all attributed to ‘C’). Ripping parts off enemies and fitting them to your own suit is cool, and the combat is pretty well-realised, with every smash and explosion animated with relish. The quality of the presentation is curiously inconsistent; backdrops and the in-game HUD are crude and basic, though in contrast, menus, the opening FMV and the large, bold and smooth sprites that grace the levels are far more contemporary of 1993. The level design itself is a let-down however. 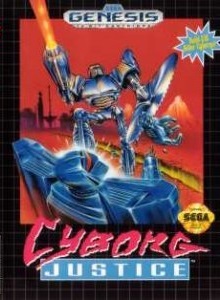 Whilst with every new level, SEGA’s best brawlers presented interactive scenery, new hazards and new foes to contend with, Cyborg Justice appears to exhaust most of its resources on the combat element, and underneath a clinical sci-fi veneer, it lacks an anarchic spark that made the aforementioned scrappers such gleeful fun. Typically a stage will see the player fighting one or two robots at a time (depending on the difficulty level), before being tasked with dodging or leaping over missiles that inexplicably fire in from the periphery of the screen, before you meet another foe. Thematically, things really don’t develop from here, and its samey nature is hindered further by stages looking more or less identical to one another, with little more than a hasty palette-swap to identify where you’re at. There are no pick-ups (save for ‘body parts’ salvaged from the wreckage of beaten foes), and only the most arbitrary of nods toward platform elements in what are otherwise very barren locales. Cyborg Justice strikes a good balance difficulty-wise, with a range of skill settings and supply of lives to allow relative beginners a good stab at things. There’s also a ten stage Duel mode thrown in, and though it’s clearly there to capitalise on the popularity of Street Fighter II, it actually acts as a legitimate practice mode, not only giving you the opportunity to test out the various move combinations, but also to garner an appreciation for the varying tactics the A.I. employ, as success will generally require a bit more finesse than most button-mashers. There is however the odd nasty surprise in store, most notably from bosses who, as well as looking more or less exactly the same as one another, can perform instant-kill manoeuvres that not only take a life, but an entire continue, which is extraordinary as it also lands you back at the start of the level. If you’re playing on the higher difficulty levels, that’s a tough way to get an instant Game Over. Traps such as spiked floors and whirlpools that stop the player in their tracks seem an after-thought and are entirely uninspired, and there’s an uneasy feeling that the lumbering bots involved are all just a little bit too large for their surroundings, a sensation heightened in the lifeless multiplayer that has little of the camaraderie that such a shared experience is meant to offer. It’s a strangely detached two-player; like having two characters dumped into a single-player game, and though you may progress, it’s unlikely you’ll end up whooping at the prospect of sending robots to an early scrapheap. Cyborg Justice would have been the bees’ knees had it arrived three or four years earlier, but by the time of its release, there was simply far too many games that offered a more playable experience and, perhaps crucially, a far more inviting multiplayer setup. Scrolling beat ‘em up fans will no doubt relish what is a bruising and, at times, quite stylish fighter. But for all the neat animations and robot customisation, a large part of you will be yearning for the more assuring iconography of collectible chickens, smashable scenery and portable-size lead piping left fortuitously at your disposal.